Solza is like a synovial fluid filling all the spaces in between the bundles of cortex, rebuilding the fibers inside the hair, leaving a perfect moisture balance. This remarkable cream will build while eliminating dry, dull, lifeless hair leaving it bouncy, shiny, and healthy again. The hair will have new life in just one treatment. Following the directions below, you will experience amazing results! 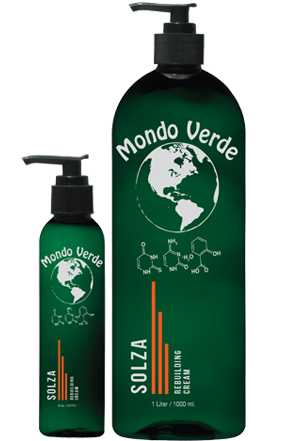 Shampoo the hair with Mondo Verde Clean Start, rinse and towel blot. Spray Mondo Verde Sweet Water on the hair until it drips. Put a plastic bonnet over the hair and put under a warm dryer for 5 minutes. Carefully remove the bonnet and discard any substance that has collected in the back of the bonnet. Work Solza Cream into the hair gently, replace the bonnet and put back under the dryer for 30 minutes, rinse and style. For severe breakage, rinse, towel blot and repeat the Sweet Water and Solza treatment. This treatment must be done after every chemical service. It will last until the next service. Great for revitalizing damaged hair anytime. This product is a pure, botanical formula like no other. You cannot achieve the same results with anything else. Because of its purity and the science behind it, it will penetrate faster deeper and last longer.